What Are the Advantages of Using a Roth IRA vs. traditional IRA vs. a 529 Plan When Saving for College Costs? Your friends Dan and Ashley have a son who will start college in 7 years. They would like to save some money for his college fund, but they are unsure about the best way to do so. Right now they have $10,000 in cash set aside for this purpose. Over the next few years, they’d like to continue saving more money for his college education. To make the most of what they’ve already saved, they’re considering putting the $10,000 into a 529 plan, into a traditional IRA ($5,000 into Dan’s and $5,000 into Ashley’s), into a Roth IRA ($5,000 into Dan’s and $5,000 into Ashley’s) or doing some combination of these options. Assume that Dan and Ashley will receive a full state tax deduction on a $10,000 contribution into a 529 plan. Also assume that they meet eligibility requirements to contribute $5,000 each into their traditional IRAs and/or Roth IRAs. What is the best way to invest their intial $10,000 savings for their son’s college costs? Answer 1 is probably the best answer. While you can avoid the typical 10% early withdrawal penalty from a traditional IRA for qualified educational expenses, the amount of the withdrawal is still subject to income taxes. This means that using a traditional IRA as a college savings vehicle is probably not the best option. A Roth IRA is typically preferable to a traditional IRA for saving for college since the amount withdrawn for qualified educational expenses is not subject to income taxes under most circumstances. A 529 plan is similar to a Roth IRA in that money grows tax-free while inside the account and money can be withdrawn tax-free for qualified educational expenses. A significant difference between a 529 plan and a Roth IRA is the potential for a state tax benefit for a 529 plan contribution. In this particular case, Dan and Ashley receive a state tax benefit for contributing to a 529 plan. They would not receive this benefit for contributing to a Roth IRA. There are some scenarios where a Roth IRA makes as much sense (or even more sense) than a 529 for college savings. In some states, there are no state tax credits or deductions for state taxes for contributions to a 529 plan. Also, Roth IRAs are not counted as assets on the Free Application for Federal Student Aid (FAFSA) so having money in a Roth IRA will not hurt a student’s financial aid eligibility. About 5% of the account value of a 529 plan is counted as an asset on the FAFSA, so having money in a 529 plan could hurt the student’s eligibility for financial aid. In a scenario where there is no state tax benefit for contributing to a 529, and having the money in a Roth versus a 529 would make a material difference in the student’s financial aid eligibility, it might make sense to use a Roth IRA for some or all of college savings. On the other hand, when you take a withdrawal from a Roth to pay for college, that withdrawal amount will be counted as income on the following year’s FAFSA, thus hurting the student’s eligibility for financial aid going forward. In that case, it might make sense to use a Roth IRA to help pay for the final year of college only. 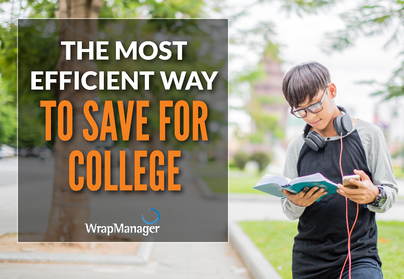 Also, using a Roth IRA instead of a 529 plan provides flexibility in case a child does not go to college at all or does not use the full balance of their college fund. While a parent can change the beneficiary of a 529 plan to another family member (or even themselves) to use for qualified educational expenses, they will have to pay federal taxes and a 10% penalty on earnings if they take money out of a 529 plan that is not used on qualified educational expenses. In most scenarios it probably makes the most sense to use a 529 plan instead of a Roth IRA for college savings, especially if there is a state tax benefit for using a 529 plan. This quiz is intended for informational and illustrative purposes only. This material is not intended to be relied on as a forecast, research or investment advice, and is not a recommendation, offer or solicitation to buy or sell any securities or to adopt any investment strategy. The information presented is general information that does not take into account your individual circumstances, financial situation or needs, nor does it present a personalized recommendation to you. The information and opinions contained in this material are derived from sources deemed reliable, are not all-inclusive and are not guaranteed as to accuracy.